Light dinner, tea, and snacks will be served. 7:00 pm - 10 pm every Friday in Berkeley, CA. ​Please RSVP at 510-910-8501 or below in 'Weekly RSVP' section. Newcomers are very welcome. Beginner Hour is from 6:00 pm - 7:00 pm every Friday, and please RSVP at 510-910-8501 or below in 'Weekly RSVP' section so a facilitator knows to meet you there early. Please read the orientation primer. 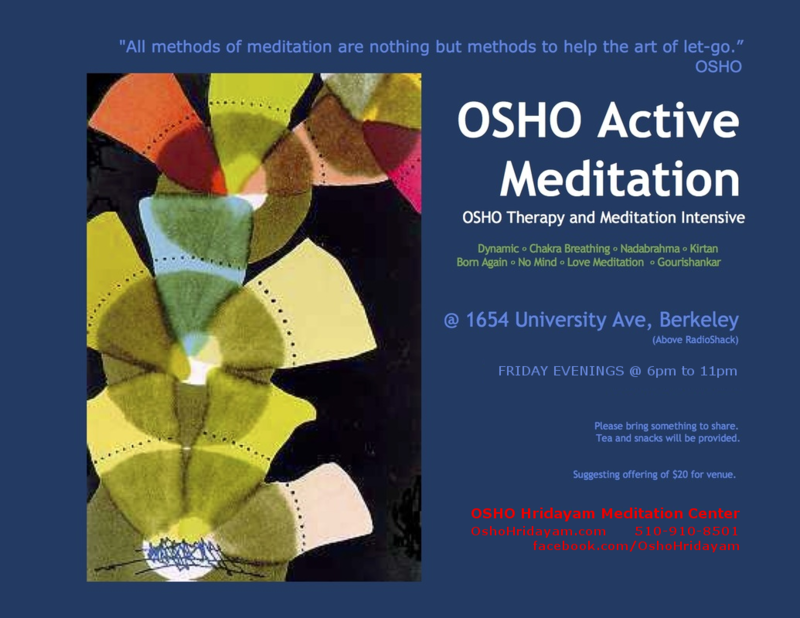 The current location is at 1654 University Ave, Berkeley, CA 94710. There are door codes and locks at the entrance that needs to be unlocked, so text us at 510-910-8501 on arrival. Beginner hour starts at 6pm. Friends can also arrive late upto 8:30pm to accommodate various life circumstances. Please don't be shy if you are tired and have to come late or you are rescheduling your participation last minute. Kindly rsvp below with your new updated schedule. ​This information is for us to notify you if there are any changes to schedule, or take care of you incase of emergency. Contributions are how we maintain the meditation space. The suggested amount is $20, but no one will be turned away or noticed for lack of funds, because we also know what a valuable, priceless, precious, wonderful gift meditation is in a person's life. One-time contribution prior to the event and recurring weekly/monthly contributions are made here. We are currently looking for upto 5 additional monthly contributors. Dear friends, your weekly RSVP helps us plan the night. If this is your first visit to our meditation, or first time using this form, please fill the Registration tab also. Contact us here for any questions, clarifications or to say Hi!